Hello from Doha. I just completed the 6,705 mile journey from New York to Doha aboard a 777-300ER featuring Qatar Airways’ new Qsuite. The new business class hard product is revolutionary in terms of its privacy and personal space. Photographing the cabin is difficult because the walls of each suite nearly ascend to the level of the opened overhead bins. But what a beautiful layout! For once, the carefully crafted corporate pictures were not hype. 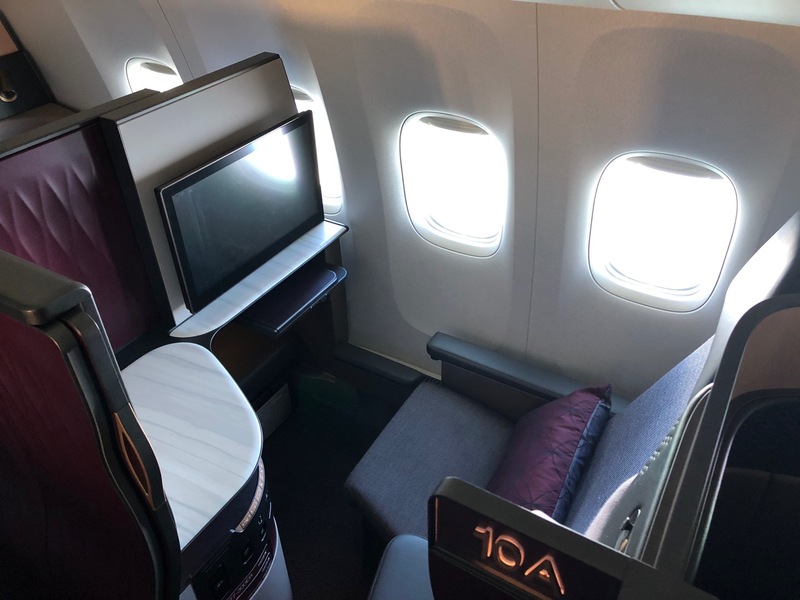 Add to that the ability to breakdown partitions so a group of up to four can travel together and you have a suite that eclipses every other business class seat I have ever flown. Inside the suite the attention to detail was amazing. Every switch, button, and plug was carefully placed and the suite had plenty of personal storage. It’s a hard product that works well. Ah, but the soft product…did it live up to the challenge? Yes and no. The dine-on-demand menu was as expected, featuring a wide selection of dinner, snack, and breakfast items. My steak was poor…overcooked just like last time and the time before: my fault for not learning. Service was well-intentioned, but not well-executed. Dinner dragged out far too long and simple requests like bringing my clothes back so I could change out of my pajamas or bringing me coffee required follow-up. Qatar also has no wi-fi onboard this plane, which is a big missed opportunity. But perhaps I hold Qatar Business Class to an unfairly high standard over others. The bedding was excellent (a FA volunteered to make my bed) as were the pajamas. I’ll publish a full trip report in the days ahead, but overall I love this product and only caution you just to avoid the pre-cooked steaks on Qatar Airways. That’s nothing in the big scheme of things. Next Article Is Compensation Due When a FA Fails to Wake You Up to Eat? Even with an overcooked steak its still easily the worlds best Business Class. The walls aren’t that high. They use the word suite quite loosely. They are just as high as the suites offered by other airlines, with the exception of Emirates’ new fully-enclosed suite. Oh wow. Like lucky, you now fly for no reason. Why shold someone read your review of there are already a few it there. Listen to me! Brand yourself as the flying leprechaun get recognition. Because it will be well-written and insightful. As an aside, I booked my ticket in July…I’ve been looking forward to this for more than six months. This is not something I booked a few days before. @Matt, I’m flying Etihad Business Studio for the first time (AUH-JFK) and may have an opportunity to change to a QSuites flight (DOH-JFK). Do you think it’s worth changing? Still worth it for a $150 fee AA may charge? Not sure it is worth the change. How would you get from AUH to DOH or will you be somewhere else? It’s a great product…better than the Business Studio…but there is nothing wrong with Etihad. Thanks for response Matt. Will be in CMB and need to head back home to JFK so already booked in Business Studio so considering changing to QSuites. Seven years ago this would have been a short-list contender for top first class hard product. Amazing how the arms race has raised the game and experience for us all. Agree. Amazing how far business class has progressed. Amazing how Emirates is still persistent with their 2-3-2 Business Class config with others upping their ante. They may be the best in the air but my experience of connecting flight at Doha was third World and Qatar’s ground staff beyond rude. Never again. I get the rude staff part, but how can you say connecting was third world? I’ve connected in Doha so many times and it has always been easy. Plus, Hamad Airport is beautiful.